The other violations listed by the panel headed by former Supreme Court judge justice K S Radhakrishnan include carrying overload in goods carriages and carrying persons in goods carriages, driving vehicles under the influence of drink and drugs, using mobile phone while driving. “The Committee further directs that in case of driving a vehicle under the influence of drinks or drugs, the police should prosecute the offender and seek imprisonment as prescribed under Section 185 of the Motor Vehicle Act, 1988 even for the first offence”, said the report. It also directed that the helmet laws be made applicable all over the State/UT both for main riders and the pillion riders. “In case where the law relating to the use of helmet is violated by either the main rider or the pillion rider, they should both be subject to Road Safety Education and Counselling for not less than 2 hours before imposition of fine as prescribed under the Act”, it said. It said those who violate the seat belt law should also be subject to Road Safety Education and Counselling before imposition of fine. The Committee also directed the States and Union Territories to submit action taken reports at the end of every three months starting from 1st Sept, 2015. 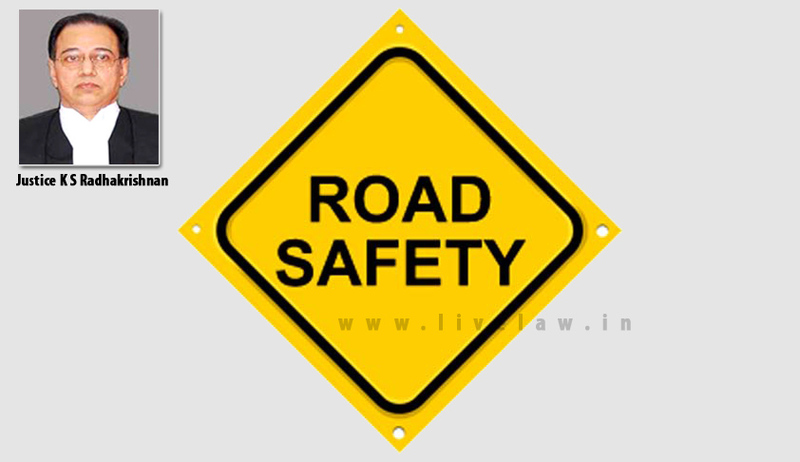 The committee was formed on April 22, 2014 by the apex court on the basis of a Public Interest Litigation to measure and monitor the implementation of road safety laws in the country. The Justice Radhakrishnan committee states that 1,37,572 persons have been killed in 2014 according to statistics from the Union Ministry of Road Transport and Highways. It said India has one percent of total vehicle population in the world and a “staggering” 10 percent road accident related deaths. The committee has so far submitted four reports to the Supreme from October last year to March 2015. It has pointed out serious lapses in implementation of safety laws by States, which has led to increasing number of road fatalities. Read the directions of Supreme Court Committee on Road Safety.